Young squirrel is good simply quartered and fried. Old squirrel is good stewed. 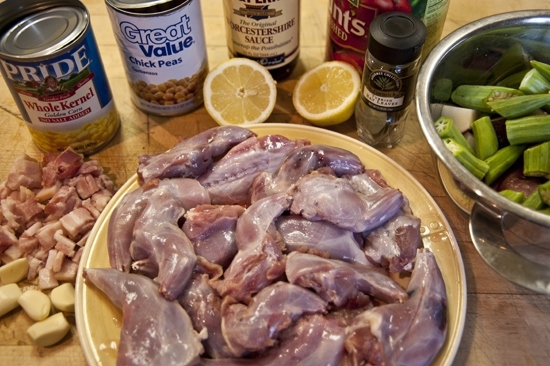 When in doubt, it is safest to braise or stew a squirrel. Sometimes, for flavor and for whimsy, I like to add acorns to this recipe. Native Americans used to eat acorns, usually by grinding them and then boiling them. They are sometimes bitter because of their tannins, but this can be improved by grinding them and running them under cold water. Acorns from the white oak, the chestnut oak, the swamp white oak, and the Garry oak are all ideal. This was an old squirrel, which I cooked in Arkansas a little while ago. Since I was in girl hunter mode and not photographer mode, I didn’t take a lot of step-by-step photos as I normally do. But the directions are detailed in the recipe. And of course you can be flexible and include your favorite ingredients! Here is what you’ll need: squirrel, garlic cloves, bacon, corn kernels, chick peas, Worcestershire sauce, lemon, tomatoes, bay leaf, okra, potatoes, beer (not pictured), cayenne (not pictured), sea salt (not pictured), and rosemary (not pictured). You will first par boil the squirrel in water with a nice dose of sea salt, lemon halves, rosemary, bay leaf and cayenne. As it simmers for an hour, skim off the foam that rises to the surface. Those are the impurities, and the lemon, salt, and rosemary are particularly excellent at extracting them. In a separate pot, you’ll render the bacon, add the onion and garlic cloves, deglaze with the beer, and then add the remaining ingredients. Once you saute them for a few minutes, you’ll add 2 cups of the squirrel cooking liquid from the other pot, then the squirrel and Worcestershire sauce. You’ll cook this for another hour until it is all tender and stew-like. Then season it to taste. It is wonderful and is a dish that was often made by my great grandmother and other great grandmothers across the land. Give it a try! And of course if you don’t have squirrel in your midst, other proteins will work well. 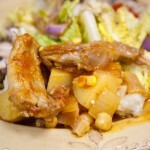 For more squirrel recipes, check out the book "Girl Hunter"
Place the squirrel parts in a pot and cover with water. Add the lemon halves, rosemary, bay leaf, cayenne, and about a tablespoon of sea salt and bring to a boil, then lower the heat to a simmer. Cook until the meat is tender, about 1 hour, skimming the foam from the surface as it forms. Once the meat is tender, turn off the heat and let the liquid cool. In a separate pot, render the bacon. Add the onion and garlic and cook until softened. Deglaze the pot with the beer, scraping up the brown bits at the bottom of the pot with a spatula. 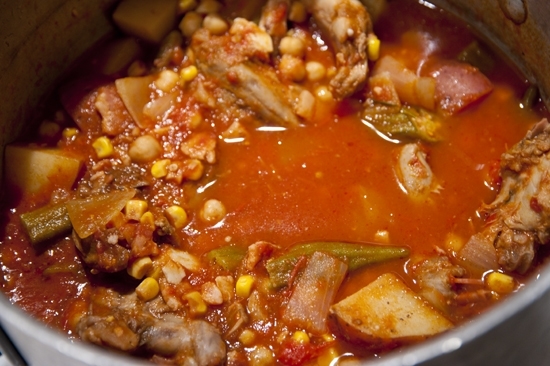 Add the tomatoes, potatoes, okra, chickpeas, corn, and acorns and stir. Add 2 cups of the squirrel cooking liquid and stir in. Add the squirrel and Worcestershire sauce and simmer for 1 hour. Season with salt and pepper to taste. 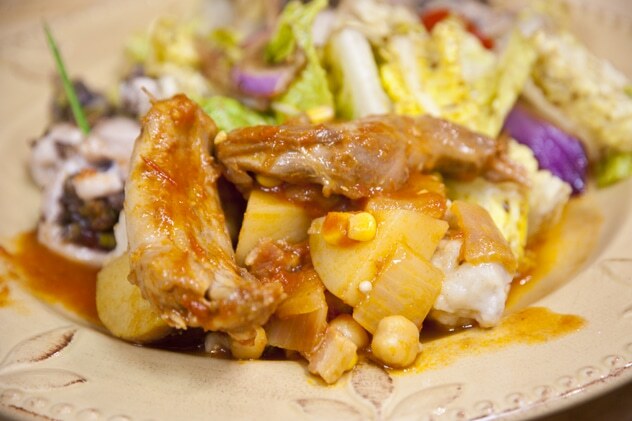 With this stew, as with most, it is best to let it sit for several hours before serving. I am having problems just trying to get my wife over the fact what she ate has once been living. She has problems just trying to pull the bag of guts out of the chicken! I love to hunt squirrel and I want my younger kids to enjoy it as I do, but I’m afraid to bring it into the house because of her squeamish reactions. Does your book include anything about how to get over the fear of a eating an animal that you harvest from your own hands? She needs some words of wisdom. Thanks! I think you should have her read my book, it has converted a lot of people. We love to have folks like you with ideas like this cook, look us up and give us a try. Question? Could I substitute walnuts for the acorns? Our family grows/sells English Walnuts & so we have an ample supply of these, yet a limited supply of acorns now with the snow covering the ground here in Michigan. If so, what would be the best way to add another nut to this recipe? (Ground, soaked, pieced, whole?) Thanks so much~ LOVE your book & recipes! Of course you can! You can also skip them all together. Just chop them up roughly. Let us know how it turns out! Your recipe doesn’t mention how to do the acorns. How long do the cracked nut meats run under the water? Also, How do you get the shells off? A hammer leaves them mashed to a pulp. OUr husky pup just grabbed a bunch of acorns and started to chomp them down. The first one was white, but the ones after were shriveled and brown. He loved the white nuts inside. he spit out the brown nut meats I take it that white nut meat is good, and the ones we want. How do you tell a good acorn from a bad acorn before you crack it open? We have lots of oaks in California. It would be fun to use the acorns! Do you debone the squirrels at any point or just leave it bone in? My son Came home with four yellow bellied Marmots this fall here in Colorado. We had a hard time Finding a reCIpe until we Branched out and SUBSTITUTED the squirrel for marmot. Good stuff, hell even mom ate it. Thanks for the recipe we enjoy your web site.